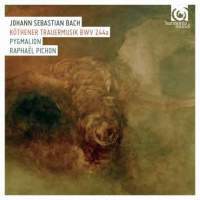 For Pygmalion’s debut disc on Harmonia Mundi – following a small but perfectly formed legacy of Bach recordings for Alpha – Raphaël Pichon has turned to a work whose music has disappeared but can, to a significant extent, be surmised from extant sources written in the late 1720s. The funeral music for Prince Leopold is thus drawn principally from the Trauer Ode and St Matthew Passion. Morgan Jourdain’s reconstruction is not the first attempt on disc to imagine the sombre proceedings of November 1728. Andrew Parrott’s 2011 version takes a rather different view in both tone and context, not least challenging assumptions of what music might have been sung at which service – burial or memorial – and presenting the post-sermon Dictum with the fugal choral movement of the Trauer Ode, while Jourdain is convinced that the second Kyrie of the Mass in B minor is the answer. Striking is the distinction and distinctiveness of the music-making in both readings. If Parrott distils the essence of Bach’s musical ‘mourning weeds’ with profound intimacy and inner coherence, Pichon’s vision is more candidly theatrical in projection, grand in concept and more even in the quality of solo vocal work. (It’s worth buying the disc just for Damien Guillon’s ‘Erhalte mich’, unsurprisingly set to ‘Erbarme dich’). There is a sense, however, that, as each great St Matthew number is rolled out, one is dealing in a somewhat discrete set of tableaux; that no original recitatives survive may contribute to this, though Pygmalion’s kaleidoscopic vocabulary is nevertheless consistently alluring and the imagery tellingly visceral. Indeed, the sensibility of Bach’s memorial music raises, as Bach presents it ‘authentically’ in the great Trauer Ode, the matter of how performers respond to this particular genre. Perhaps unduly influenced by the gentle gracefulness of Jürgen Jürgens’s 1968 recording of the Queen of Poland’s elegy, Pygmalion carry over little, in this new memorial canvas, of that reposeful elegance of the movements derived from the Trauer Ode. Instead, we have a series of beautifully considered and chiselled set pieces. What we lack is the continuity of reflective sentiment, an incremental sense of unfolding poignancy which Parrott presents so atmospherically.